A visual cinematic feast, it is only fitting that Paprika be screened as the first part of Reel Asian’s Food For Thought series. We’re adding some POP to our screening with an opening reception featuring food-inspired pop-art from Lillian Chan, a popcorn spice station, and a selection of Asian flavoured soda pop. 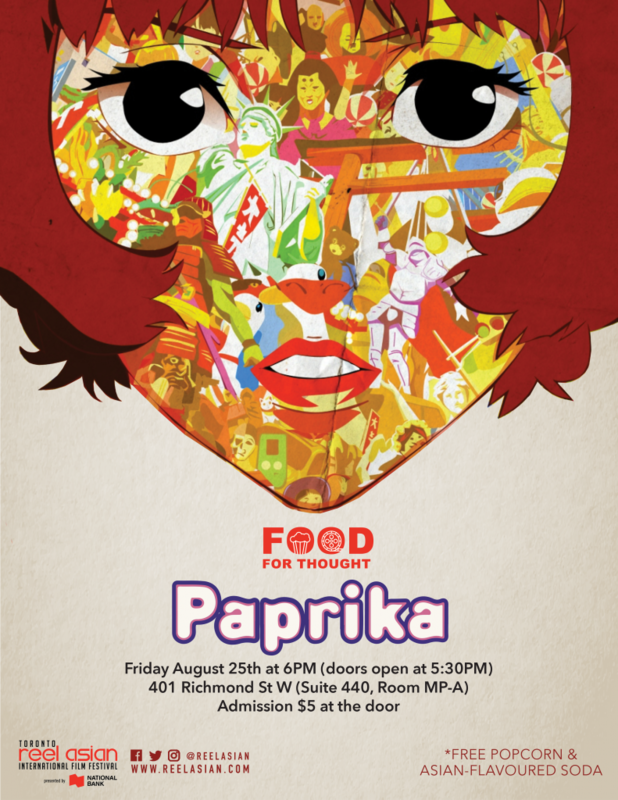 Join us for Paprika on August 25th at Reel Asian’s new home and new screening space at the The Commons (on the 4th floor next to the patio) at 401 Richmond. The final work of Japanese animator Satoshi Kon, Paprika is a mesmerizing visual presentation paired with an intriguing mystery. The sci-fi anime follows Dr. Atsuko Chiba, the pioneer of a new psychotherapy technology that allows her to enter the dreams of her patients as an avatar called Paprika. When the tech is stolen and used by terrorists to infiltrate the dreams of the scientists involved in the project, she maneuvers through reality and dreamscape attempting to identify the thieves and prevent the two worlds from colliding.